It's 1030pm and we've only just picked our children up from their back to back performances with the Magic Of Christmas, so it might not be too much of a stretch to say that our family is committed to music. Primarily we are singers, all four of us. Olivia and Adam play a bit of piano and Olivia has picked up the guitar again. And singing we do. A lot. We all sing with a community choir and music is always playing in our home. So from the moment that Santa arrives at the end of the Macy's Thanksgiving Day Parade to Boxing Day, we are singing carols. Recently our friend, Zoa asked me about that, the singing of carols, as she knows that our family is not a Christian family. I explained that for most part, we have a deep appreciation for the history, the storytelling, the imagery, the beauty and tradition associated with Christmas music. Having sung in choirs all our lives, we have learned many of these songs inside and out and leaving them behind (or changing the lyrics, ew, no thanks) just wouldn't feel right to us. Also, many of the old songs are actually very evocative of Pagan imagery and seem very Nature-based. For instance, I've always loved Joy To The World. Since much of Christian imagery and doctrine is actually Pagan in origin, I easily hear the lyrics as a Solstice song: the Sun returning to the Earth, Nature sings, every heart prepares Him room(the returning Sun warms and reaches all corners, hills and dales of the land and all living creatures celebrate the longer days). Even the mention of the thorns reminds me of the legend of the Holly King and Oak King (and the thorns no longer rule, infest the ground). And then there are the wonders of his (Sun) love (shining as it is upon the earth)-oh joy to the world, indeed! So I sent a list of some of our favorite music collections. Many of our beloved Yule songs are from our music collection (partial), below. Forgive me for not linking to each of these cds. I have included the full titles, so you should be able to find them easily enough. I have recently learned of Sufjan Steven's Songs For Christmas, thanks to my friend, Julie, and have included some selections on the mix. I have not listened to the entire five disc collection yet, but I like what I'm hearing. Also about the mix-I've included a few strictly winter pieces and some choral pieces as they reflect our love of choral work (Blow, Blow Thou Winter Wind, Tomorrow Shall Be My Dancing Day). Additionally, the mix is missing The Carpenter's Merry Christmas Darling, as Karen's version is unavailable and anyone else singing it (I'm looking at you Glee) is just not okay with me. At all. It's one of my favorites and yes it just about chokes me up every time I sing it. Of note are a couple of gems. Since I was small, I've adored Harry Belafonte's Mary's Boy Child. His voice is rich and amazing and the whole imagery of the mother and baby, in any song, has always plunked my mothering heartstrings (also see Cherry Tree Carol, The First Noel/Mary, Mary, and Muppets-Bless Us All--sob.) Speaking of sobbing-and spoiler alert on any of these three movies: When Harry Met Sally, An Affair To Remember or It's A Wonderful Life-just...grab me tissues. Included in the makes me sob category are Wintersong, Have Yourself A Merry Little Christmas and That Spirit of Christmas (especially when 11 year old Adam sings along with Ray and hits every single bluesy note). On the historical side of music, we love the works of the Boston Camerata, Baltimore Consort, Loreena McKennit and The Cheiftains. We also have a collection of Yule music on vinyl. There's one that still has the power to instantly send me back to my childhood Christmases, and it's simply carols recorded in music box, and thank you interwebz, I just found a whole post on it. Is there seasonal music that makes you reach for the tissues or makes your belly flip-flop with joy or raises goose bumps? 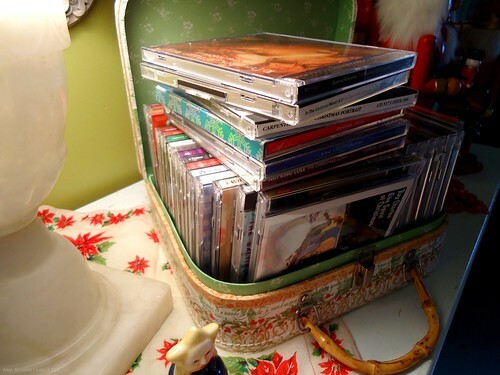 Do you have any musical holiday treasures I need to know about? Any guilty pleasures, cheesy, retro, or? If so, please share, I'd love to know. I love "christmas music", especially "baby it's cold outside" sung by margaret whiting and johnny mercer!!! I love cowboy christmas poetry and songs/poem like "the christmas letter"by waddie mitchell and the native american vision "corn, water and wood" on Michael Martin Murphey's cowboy christmas songs volume II (a great show to see live is his "cowboy Christmas Ball" with all the irish ballads and polka music and dancing!) I was lucky enough to see it in Virginia City, Nevada in an 1890 era brick "gymnasium" and I will never forget how fun that snowy night was! I also love the off color, "merry Christmas from the family" by the dixie chicks on one of Rosie O'Donnell's christmas cds...makes me laugh every time! thanks for this post! Windham Hill 'Winter's Solstice'. They have several versions out, but the first one is the very best. All instrumentals, all evocative of the amazing pregnant pause that is Solstice.